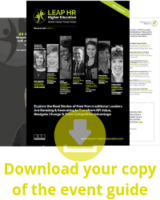 LEAP HR: Higher Education is a unique forum where you can explore exactly how the most progressive HR leaders in higher education are reimagining the way they maximize HR value across their institutions. This event will explore what the future of HR in higher education will looks like and enable you to walk away with the practical strategies you need to totally revolutionize your HR impact, and truly move your institution forward. 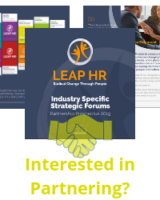 LEAP’s unique format combines presentations delivered by true disrupters coupled with the chance to engage in meaningful discussions in interactive round table sessions. This means that you’ll have the opportunity to take part in a truly collaborative discussion around how HR can challenge the status quo in higher education. This is a high-energy, high impact, fully-immersive experience. It’s the place for ambitious, non-traditional people leaders to engage in a disruptive dialogue around how to deal with the implications of working in a rapidly evolving, but change-resistant, consensus-driven industry.